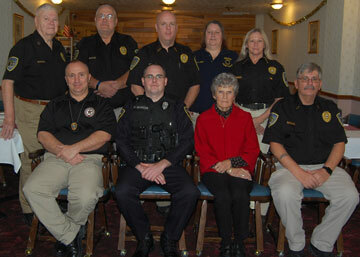 Shown seated, from left, is the nationally-acclaimed Philippi Chief of Police J. W. Walters, the new Task Force Liason Philippi Patrolman J. D. Barcus, Philippi City Council member and supporter Barbara Bryan, and Task Force Chief E. R. Flowers. Standing, from left, is Corporal and Secretary/Treasurer D. A. Smith, Lieutenant L. G. Jones, Patrolman 1st Class D. K. Nicholson, newest member Patrolman H. E. Beaver, and Assistant Chief and Quartermaster S. K. Spotloe, Not pictured is Sergeant and Chaplain B. P. McLean. Since its founding, the Task Force has depended on government grants, local business contributions of equipment, and personal gifts from interested citizens. Supporting businesses have included Walmart, Rite Aid, Smith’s Drug Store, Mace’s Pharmacies, Blackheart International, and Southern States. During calendar year 2018, an aggregate of 87 members gave a total of 231 hours in support of 20 different activities and 9 training sessions. Currently, seven active members meet monthly at Philippi Police Department headquarters. Certain ranks are elected by the membership while others are earned through a compilation of service hours. Membership is open to qualified adult men and women in good health who are in good standing with law enforcement. Applicants undergo a background check to assist in determining eligibility. Applications are available at the Philippi Police Department.